Thursday, March 12, 2009 EA invited us to attend a little shindig at an upscale sports bar along San Francisco’s Bay-facing Embarcadero, where professional gaming geeks went for a play date. The occasion? EA Sports line showing off some of their upcoming games, including three near-future releases for the Wii: Grand Slam Tennis, Tiger Woods ‘10, and EA Active, two of which are new “franchises” for the company. Rightfully taking up a fair amount of floor and wall space for its two displays and flexing female demonstrators I found EA Sports Active; a title I’d heard nothing about until precisely that moment. EA is also calling this a fitness “product” and “virtual trainer in a box”, not just a game, even though you essentially perform athletic activities in mini-game form. It’s really more of a tool for boosting your high score in real world fitness than championing some intangible international frag leaderboard, but I’ll use “game” anyway. Simon says: feel the burn! It’s not burning enough if you’re smiling. To help reinforce its purpose, Active will ship with two stretchy packed-in accessories to assist your routines: a nunchuk-hugging leg strap and a doubly handled resistance band, all for $60. One of the title’s features is the ability to share a workout with someone, so many of the available screens show multiple people participating at once. This means these accessories must be getting shelf space to be sold separately. And what Wii release is complete without a gadget or two to make the experience a little better? To be fair, both of these do serve very good purposes for use within the game’s specific exercises. 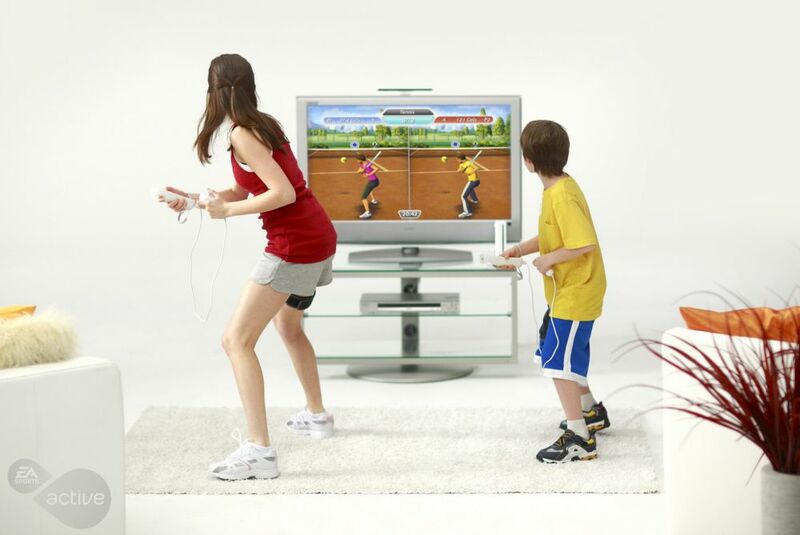 Of course the first comparison everyone will make is to Nintendo’s own Wii Fit. Considering both include a variety of categorised actions and balance board support, that’s a fair place to start, but in a foot race this would be where EA Sports Active breaks away decisively. It’s unclear how much of Nintendo’s offering was specifically designed by collaborating with real experts, but Active fully integrates it. It seems everything short of the menu design received fitness pro consultation, as the title is chock full of actual trainer guidance, instruction and real-time feedback to help keep you on track. You even get video introductions from each trainer outlining their personal philosophies, if that might help align yourself with one of them. 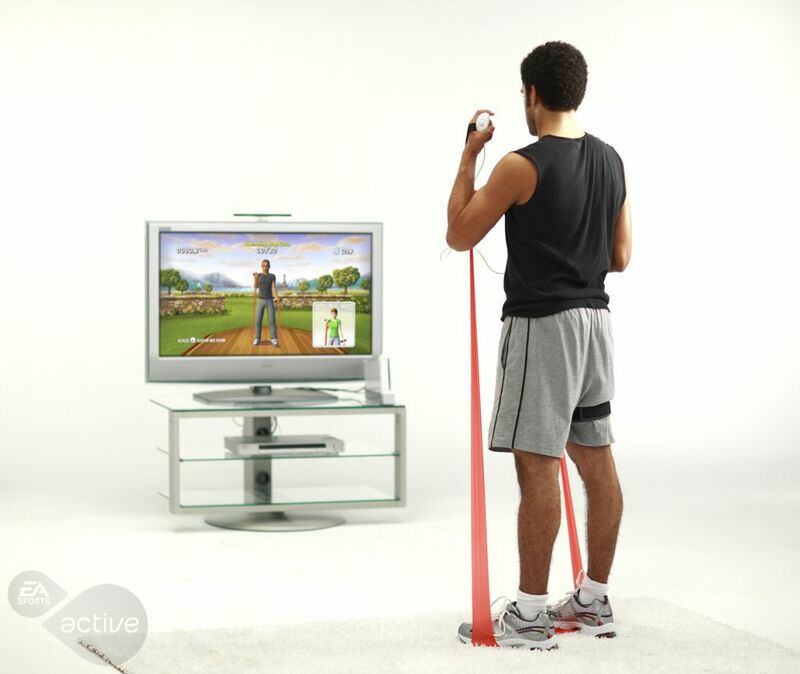 Also, one of the biggest critiques of Wii Fit was the inability to assemble a custom, cohesive workout like an iTunes playlist for exercise; incidentally one of the other main concepts behind Active. You start by creating and customising a profile along with a Mii-like avatar, complete with both your physical and lifestyle attributes. From there you can formulate a plan and goals for your fitness future, including something called a “30 Day Challenge”, where you’ll work with one of the in-game trainers to chart your progress and parlay it into a bigger, long-term fitness picture. During the challenge, your trainer creates a new 20 minute workout each day to keep things fresh, interesting and comprehensive. Perfect for those long days between takes at the photo studio. If you have different scheduling requirements or just like doing it yourself, Active lets you quickly hop into a variety of preset workouts or customise your own. Divided among four main categories (Upper Body, Lower, Cardio, and Sports) are 25 activity types, each one containing a number of events related to that activity. For example, you might narrow down such: Sports > Basketball > and then choose from among several specific B Ball-related events like Free Throws or a target practice-like Passing exercise. Using this process, you can chain together a precise, tailored session to match your available time, mood, or target zone; you can even adjust the duration and difficulty of each chain link in your overall workout to carve out just the calories and challenge you want. Something that never felt quite right about the running exercises in Wii Fit was that the solo Wiimote usage didn’t feel very accurate. I enjoy running, but have never been able to go 7.5 miles in 20 minutes on any real world course. 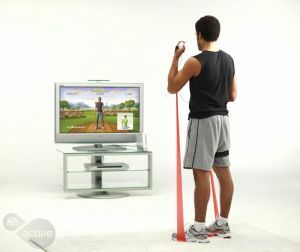 Using the balance board under the kind of stress and pressure exerted by pounding feet to measure lower body activity is impractical, if not dangerous, so EA is bundling a specially designed leg strap that cocoons the nunchuk and its accelerometers to help with those measurements. It would be incredible if it somehow measured pulse from the femoral artery, though I’m sure it would check if a good ‘chuk could. Jokes aside, the nunchuk leg strap seemed to work quite well. On screen characters responded to players’ actions with a great deal of accuracy and no latency that I could detect from my observation deck. Other activities are compatible with balance board use (not all of course), but details on which ones or how many haven’t been released, and weren’t on display for this event. How Rebecca and Timothy resolve many a siblings’ spat. Specific activities that were shown: Basketball Free Throw, Basketball Targets/Passing, Track (running), Inline Skating (complete with ramps and tricks), Dancing, Boxing (targets and punching bag), Jump Lunges, and Bicep Curls (with the resistance band).